It started innocently enough years ago with Burger King’s hamburgers, but the “have it your way” philosophy has since taken hold in almost every industry. Homebuilding is no exception. Home buyers can design their dream home from the ground up, with custom kitchens, custom bathrooms, and hallway paint colors all picked out before ground is even broken. The result, as it pertains to curtain tracks, is that the standard bathroom, with a standard, prefabricated stall, or a shower head above the prefab tub, is becoming a thing of the past. Even spas and hotels are custom-designing showers to fit their needs. This is great news for creativity, but bad news for the makers of standard off-the-rack shower curtains. Custom bathrooms and showers require custom shower curtains. Luckily, we can make custom shower curtains! 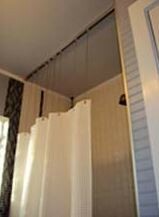 We can create a curtain that is wide enough to surround a claw foot tub, or high enough to cover floor to ceiling, when hung from a ceiling mounted track. If that is too stuffy for you, we have drapery hardware like drop chains that allow the curtain to be hung from the ceiling while still keeping an open space for steam to escape. Some of our curtain tracks can be installed with a curve or bend to cover almost any custom bathroom area. We have lots of custom shower curtain options to make your shower look and feel great. The 10-guage, vinyl Aquaguard curtain has a thick leather-like feel, will not billow out when the water starts running, and can be used as a liner or standalone curtain. If you’d like something vinyl but a little lighter, try our double polished clear vinyl 6-gauge curtain. It is clear from top to bottom and can also be used as a liner or as a stand-alone curtain for those who aren’t shy. If you love your shower experiences while travelling you may prefer our hotel nylon shower curtains, which are the hospitality industry standard. Lastly, our shower shield polyester curtains are 50% heavier than other polyester curtains, which prevents billowing, and have an elegant look with a woven “ombre” square pattern. Both the satin box and hotel nylon curtains are treated with a water and stain repellent finish. Visit us on Pinterest to see some of our custom shower curtains in action.